Pheochromocytomas are rare neuroendocrine tumors, with a malignancy frequency of approximately 10%. The treatment of malignant pheochromocytoma is palliative, and the traditional management strategy has limited efficacy. Furthermore, no clear criteria exist for the treatment of metastatic pheochromocytoma, especially for unresectable lesions. 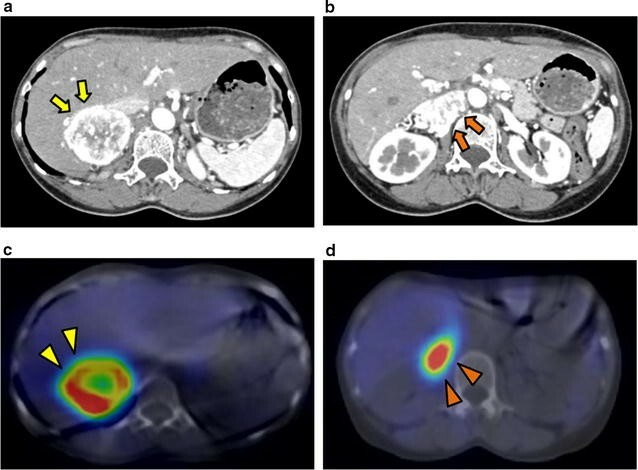 We report a case of complete remission of metastatic pheochromocytoma in 123I-metaiodobenzylguanidine (MIBG) scintigraphy after a single session of 131I-MIBG therapy. A 61-year-old woman had a right adrenal grand tumor and lymph node metastasis on the hilum of the right kidney, both of which incorporated MIBG. After surgery, immunostaining of a tumor specimen showed expression of the tumor makers chromogranin and synaptophysin. One year postoperatively, abdominal computed tomography revealed a local recurrence and retroperitoneal lymph node swelling. The local recurrence was positive for MIBG uptake, whereas the swollen retroperitoneal lymph nodes were negative. She underwent surgery again, but the local recurrence was unresectable because of rigid adhesion to the surrounding tissue. Immunostaining of an intraoperatively extracted swollen retroperitoneal lymph node showed expression of tumor markers. The patient then underwent a single session of 131I-MIBG therapy (7.4 GBq, 200 mCi), after which the residual lesions no longer incorporated MIBG, and a complete response in 123I- metaiodobenzylguanidine (MIBG) scintigraphy was achieved. The 131I-MIBG treatment was repeated 6 months later. None of the lesions were positive for MIBG uptake. 131I-MIBG therapy efficaciously treats unresectable lesions that are positive for MIBG uptake. Pheochromocytomas (PCCs) are rare neuroendocrine tumors with an incidence of 0.4–9.5/1,000,000 individuals . Approximately 10% of PCCs are malignant . Evaluating PCC malignancy based on pathogenic characteristics is difficult; one criterion is metastasis or recurrence in a tissue other than chromaffin tissue . Most PCCs are sporadic, but some are hereditary . It has recently been reported that PCC is associated with germline succinate dehydrogenase B (SDHB) mutations, which are found in up to 50% of patients with malignant PCC . The treatment of malignant PCC remains controversial because there are very few cases of PCC. 131I-metaiodobenzylguanidine (MIBG) therapy is the most studied targeted radiotherapy in PCC patients. The purpose of this report is to present a case of PCC and to discuss the treatment of malignant PCC. A 61-year-old woman (height, 148.9 cm; body mass index, 21.3 kg/m2) had a right adrenal gland tumor. She had no relevant medical history or family history. Endocrinological examination of her blood indicated a high noradrenaline level (3429 pg/mL). The 24-h urine collection revealed high levels of noradrenaline (728 µg/day) and dopamine (1092 µg/day). On admission, her blood pressure was 169/85 mmHg. Abdominal computed tomography (CT) revealed a 5-cm right adrenal gland tumor and a 4-cm lymph node metastasis on the hilum of the right kidney. 123I-MIBG scintigraphy revealed that both were positive for MIBG uptake (Fig. 1). The patient was diagnosed with malignant PCC. The right adrenal tumor and lymph node metastasis were resected. Before the operation, she took oral doxazosin mesylate. After the operation, her blood pressure and serum catecholamine levels immediately normalized. Hematoxylin and eosin staining of a tumor specimen indicated that the tumor had a Zellballen pattern. Immunostaining showed expression of chromogranin and synaptophysin (Fig. 2), which is helpful in the pathological diagnosis of PCC, but not SDHB. Twelve months postoperatively, abdominal CT revealed a 1.0-cm mass in the area where the primary tumor had existed. It also revealed some swollen retroperitoneal lymph nodes that were less than 1.0 cm. The mass in the area where the primary tumor had existed was positive for MIBG uptake, whereas the swollen retroperitoneal lymph nodes were negative. The patient underwent another surgery. The local recurrence was rigidly adhered to the surrounding tissue and therefore was impossible to extract. We intraoperatively extracted a swollen lymph node in the retroperitoneal area for sampling. Immunostaining revealed tumor cells in the lymph node. After the operation, the unresectable local recurrence gradually enlarged. Twelve months later at another hospital, she was treated with 131I-MIBG at a dose of 7.4 GBq (200 mCi). After one treatment, the residual lesions no longer incorporated MIBG (Fig. 3). She underwent a second 131I-MIBG treatment 6 months after the first. She experienced no adverse event over grade 3 (Common Terminology Criteria for Adverse Events v4.0). To date (1 month has passed), no lesions have been positive for MIBG uptake. Although there is no curative management for malignant PCC, our case report suggests that 131I-MIBG may be an effective treatment for some patients. Current therapeutic targets for malignant PCC are to suppress the excessive secretion of catecholamines, to extend progression-free survival and to prevent cardiac insufficiency, which is the most common cause of death in patients with malignant PCC . The first-line treatment for malignant PCC is surgery. Complete resection can provide catecholamine control and allow long-term remission. Furthermore, debulking surgery may increase the efficacy of subsequent treatments. The treatment for unresectable lesions without MIBG uptake is chemotherapy. The most common chemotherapy regimen is the combination of cyclophosphamide, vincristine, and dacarbazine (i.e., the CVD regimen). The treatment for unresectable lesions with MIBG uptake is 131I-MIBG therapy or chemotherapy. However, no clear criteria exist with regard to which treatment is better. For patients with malignant PCC, the median progression-free survival time is 24–36 months after 131I-MIBG treatment [7, 8] and 20–40 months after chemotherapy [9, 10]. There has been no prospective study compared both treatments. In a previous report, 131I-MIBG was effective for patients who had small tumors or no bone metastasis . Because our patient fulfilled these criteria, a single 131I-MIBG treatment (7.4 GBq, 200 mCi) resulted in significant effectiveness. Approximately 35% of PCC patients have hereditary PCC . Germline mutations associated with malignancy include SDHB mutations. A recent report suggests that immunostaining of SDHB is a promising marker which indicates the presence of an SDHB mutation , as was observed in our case. Because tumors with germline mutations in the SDHB gene are characterized by angiogenesis , angiogenetic therapy (e.g., administration of a tyrosine kinase inhibitor) may effectively treat patients with such mutations. This perhaps includes our patient, who may have an SDHB mutation. Herein, we described successful 131I-MIBG treatment of an unresectable malignant PCC. 131I-MIBG administration could be an efficacious means of treating patients with malignant PCCs that are positive for MIBG uptake. TS wrote the manuscript and made the revisions. RA, RU, SH, AO, AI, DK and KT were involved in data investigation and the patient’s treatment. KI, KM and TN were responsible for the histopathologic investigations. YU, NK, YH and SK reviewed and amended the manuscript. TS and TY were responsible for revision of the manuscript. All authors read and approved the final manuscript. The patient provided written informed consent for the publication of this case report and accompanying images.